By mixing together a unique combination of virtual reality, brain sensing and tastes we brought Coca-Cola’s new mixing machine to life in cinema and mixed a blockbuster of our own. Wanda Cinemas deployed the BVRAIN experience in key cinema locations in Beijing, Shanghai and Guangzhou at the end of April 2016. In the 3 months of the installation over 90% of the people who took part in the BVRAIN experience went on to buy the recommended Coca-Cola product. Over 6,000 individual servings were sold within the first month. 15% of the people that took part in the BVRAIN experience shared the results in social, which is 382% higher than the average sharing rate of H5 campaign content in We Chat (Source : Tencent). At the time of writing Coca-Cola China is in active discussion with Wanda Cinemas about rolling out VR across the wider Wanda estate in 2017. A trial experience in cinemas. Wanda Cinemas is a key account for Coca-Cola in China with over 2,000 screens in over 80 cities. Coca-Cola China imported their ‘Freestyle’ mixer into China for the first time in 2016 for use in Wanda cinema foyers. The challenge for Wanda was that online cinema ticket buying means that people turn up to the cinema right at the moment when the film starts, rather than 10-15 minutes beforehand. Their spending on food and drinks has dramatically dropped as a result. The challenge for Coca-Cola was to use the Freestyle mixer to help solve Wanda’s problem. So we did a little mixing of our own. The creative idea was ‘Taste the movies’. 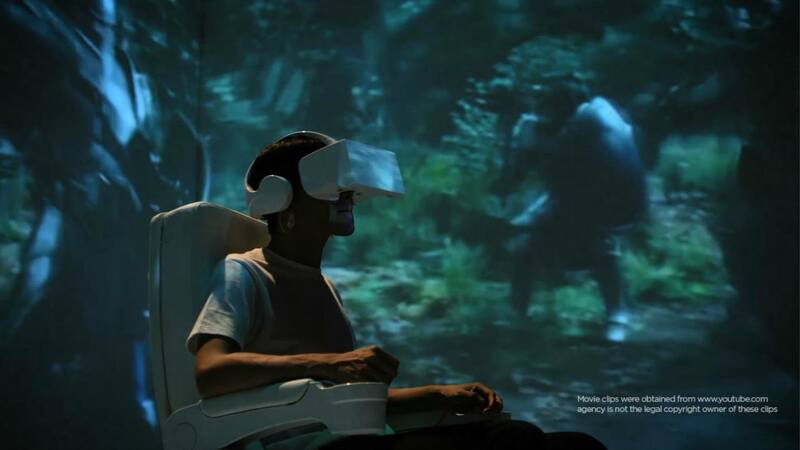 People watched movie trailers in a VR environment and their emotional response to the movies was measured by monitoring their brain activity. This analysis was the basis for a recommendation on the perfect Coca-Cola Freestyle flavor combination to match their movie preferences and emotional responses. The hardware solution was a headset that combined VR viewing capability with brain sensing technology, which was christened BVRAIN. Moviegoers watched movie trailers sitting in a futuristic pod seat in a Coca-Cola branded environment. The brain scanning results were shown on screens that were incorporated into the installation to maintain the interest of other moviegoers nearby. Once people had completed the experience they could scan a QR code to receive their perfect recipe in the social messaging platform We Chat, where they could easily share it with their friends.